Drilling Services at ODP/TAMU is responsible for developing final operational plans and drilling schedules based on scientific direction from JOIDES. This includes, among other activities, ensuring equipment availability, defining operational limitations, providing an adequate supply of consumables (beacons, drill bits, lab equipment, etc. ), assessing safety and operational procedures prior to drilling, and ensuring the organized transportation of necessary supplies between cruises. The Drilling Services department consists of three team-oriented project groups, which also work to improve the existing drilling and downhole techniques and to develop new ones required to meet scientific objectives established by the JOIDES community. 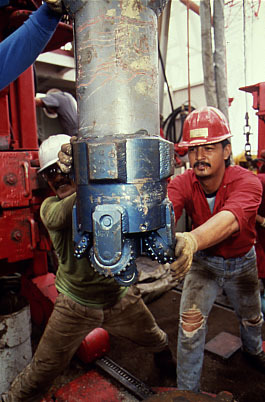 Scientific drilling and core recovery are handled by the Drilling Operations team. A member of this team sails with each cruise to provide expertise for the shipboard scientific party and to make sure scientific objectives are met within safe parameters. The Development Engineering team evaluates, modifies, develops and designs coring, drilling, and re-entry equipment, handling tools and downhole systems. The team maintains a current knowledge of, and recommends improvements to, the capabili-ties of all ship systems (hull, machinery and electrical) and drilling systems. The team also possesses an engineering knowledge of electrical and electronic systems to ensure the stability of all upgrades and additions to the ship, drilling system and lab stack. The ship is supplied with all materials needed to accomplish drilling and scientific objectives by the Material Services team, which provides inventory control, warehousing, procurement, quality control, and shipping/receiving, both on shore and on board the ship. Send comments to webmaster@iodp.tamu.edu. Modified on Tuesday, 06-Feb-2007 09:43:21 CST.